I have presented seminars on travelling to Alaska and the Yukon and afterwards I am asked: "How do I (or did you) prepare (y)our coach for that trip?” That’s a great question and one that is rarely mentioned in any travel guides that I have seen. There are two parts involved in preparing for a RV trip of this distance and time: The mental preparation and the physical preparation of your coach. I’ll provide you a guide so that you can carry out these steps comfortably. In making the decision to take a RV trip to the Yukon and Alaska, ask yourself the question: "Can we live with a "dirty" coach & towed vehicle / truck and trailer?” Then, honestly answer it. This is not meant to upset you. Due to the lack of alternative roads to travel on, the constant permafrost melting and resulting need to repair roads which must remain open, combined with the short season to complete repairs, your RV combination will be dirtier than you have ever seen it. Thankfully, it is only on some sections of the trip that you will experience road work, however it’s unlikely that you will avoid it. Don't worry about having the dirtiest coach, everyone arriving at towns or campgrounds after this road work will be driving a dirty coach. Some view it as a badge of honor - I made it! Many campgrounds and in many towns in areas where road repairs are frequently encountered have coin spray wash facilities that give you up to 45 minutes of time for $15 to $20, so you can ‘wash’ off the coach. This picture was taken in Tok, AK after a group of Caravan Tour coaches arrived, having travelled on the ‘Top of the World Highway’. Ours was as dirty. I spent an afternoon washing and cleaning it before heading out the next day. Ask yourself ‘Can I/we physically do the exterior washing required to make the trip or live with it until it can be thoroughly washed?’ At the very least the windshield will get covered with bugs and dirt that will require regular (daily) cleaning. We found that we took photos through the vast windshield (it was our window on the world) and having it clean and bug free provided some pictures we would never have been able to take any other way. The circled bug splat can be cropped out however seeing this bear wandering down the road as you slowly drove past is just one of those not-to-be missed opportunities when you are glad to have a clean windshield. It’s unlikely you would ‘stop to take a picture’ here! How do you feel about a few stone chips both to the body finish and the windshield? Excellent windshield repair services are available in major cities throughout the trip. They will come to you, charge similar rates to those at home, accept insurance payments and their personnel have lots of practice. ???? Don't be surprised if they arrive before 6:00 am or after 9:00 pm. After all, it's light most of the time and they work until each day's work is done. An honest answer to these questions is important if you truly want to enjoy the trip, since getting caught up in the issues referred to, will put a big damper on your overall trip enjoyment. If you are prepared for what to expect, then you will enjoy the trip. 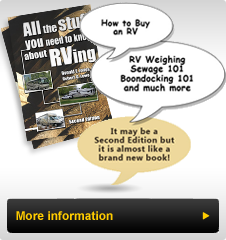 If your answer is that you can’t stand to see your RV so dirty or you are not up to the physical effort required, then choose an alternative. Some, after deciding they still want to see AK and the YT, will take a cruise (or two), others will fly-in and rent a RV, while some others will take a train excursion. Each has its positives and negatives. Try to spend as much time as you can in this area of the continent. Being prepared is more than a motto for this trip, it is a necessity to give peace of mind to all RVers. Deal with little issues that have been put off while on home turf, where upgrades and repairs can be made in a less stressful way. Planning and starting early, allows the time to deal with and budget for, the larger expenditures that are identified. Examine every system for weakness or vulnerability. Critical coach systems such as 120 VAC power, 12-volt coach and chassis power, water (including water heating), holding tank and LP (Propane) systems. Each should be carefully examined for functionality and safety. Testing all, then repairing or replacing substandard components and equipment while near your home base will give you peace of mind and allow everyone onboard to focus on the trip adventures, not missed opportunities. Are there any upgrades or features that I/we have been putting off, that would make this trip more enjoyable? Starting early allows them to be completed and thoroughly tested before leaving. Have the Engine, Generator & Powertrain serviced according to their maker's recommendation. This includes a complete chassis inspection, lubrication and any coolant and/or fluid changes in all critical components. Pay attention to services that may come due while on your trip that would be far more convenient if done before departure. Do the system maintenance to braking, suspension and air and hydraulic systems paying special attention to filters required to be serviced/replaced annually. All safety systems (i.e. wipers, lighting, braking, tires etc.) should be checked for serviceability and reliability over what can be an arduous extended trip. If you want, you can bring some extra fluids, filters and belts, even a spare tire. The larger cities have all the amenities found in the south and often service items are available faster than they would be in Canada or the lower 48 states. It is a myth that you are in untouched wilderness; people really do live in these places and they need service and parts, likely even more than an RVer does. With a short season to get the majority of their work done, (and earn their annual income); breakdowns requiring days to repair have a huge financial impact. That’s not to say that body maker parts are readily available, however most powertrain and safety components can be located while on the trip. Your goal is to avoid needing anything, recognizing that something unexpected may come up. If you plan to "dry-camp" or "boondock," (good facilities are readily available) then do a few dry runs in advance to ensure everything functions as expected. If the planned trip will rely on multiple campground reservations, be prepared for 15 to 30 Amp power, possibly a central dump station with none at your site. In some larger campgrounds, there will be some 50 Amp, "full service" sites however often these are tight, parking lot settings, with barely enough room between RVs to extend slideouts. Some remote campgrounds, rely on their own generator systems for power, may have limited water from nearby wells or have water trucked in. Some charge a few dollars extra for what would be considered the usual services in the south. Altering reservations due to changes in plans may be difficult, since cell service may not be available for days at a time. This may affect your trip planning. Even satellite systems (both Data & TV) may not function at all times, since the angle to the equator may be outside of the range of movement of the antenna. For these reasons changes may require some "no service" nights. Does the water heater or AquaHot/Oasis system function properly on its secondary power source (if applicable)? Slide outs, slide toppers, awnings, need to be checked for correct operation and that they are not frayed or have any breaks in the fabric. Inspect all windows and body penetrations for seal damage and caulking that needs to be replaced. Inspect the roof for its integrity, ensuring that areas around roof vents and penetrations are properly sealed. Ensure all vents, covers, and air conditioning shrouds are not cracked and are fastened securely. Air conditioning may not be needed in the far north however in getting there you will drive through hot summer conditions. To be continued in Technical Tip 104.